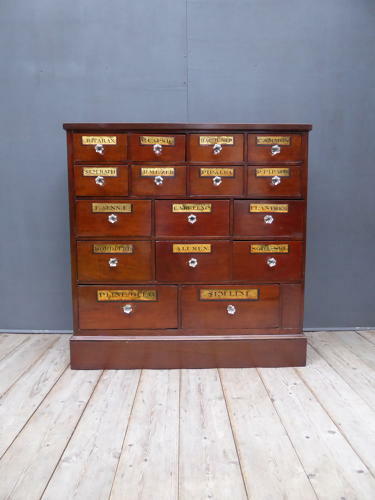 A beautiful large bank of Victorian apothecary drawers. A fantastic bank of sixteen antique pharmacy drawers with a superb drawer configuration, wonderful gilt painted labels & matching glass handles. A beautiful, usable & very decorative piece. Late 19th century, outer carcass later. Minimum wear commensurate with age, in comparitively excellent condition. As these were originally part of a fitted chemist interior, the outer carcass (top, sides & back) has been later professionally made to accommodate the drawers. The cabinet is clean & ready to use, inside of drawers could, as always, be cleaned further. Collection preffered, UK courier service a possibility, please enquire with a delivery post code for details.